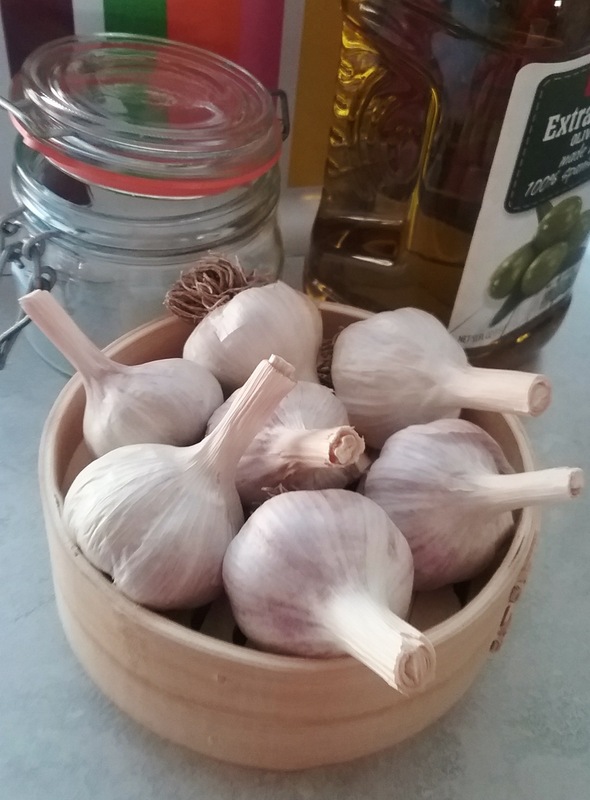 If you haven’t had fresh garlic, my friend, then you don’t know what you are missing. In our grocery stores, we are mostly familiar with dried garlic that has likely been shipped in from some exotic port across the world from us. Lacy Gage from Blue Moose Farm recently supplied me with enough heads of well-groomed garlic from her luxe gardens to make a full complement of fall garlic confit. Yes, we love our garlic, but fresh garlic is the real deal. It is juicy, easy to peel, sweet, and has flavor worth shouting about. Anything else pales in comparison. 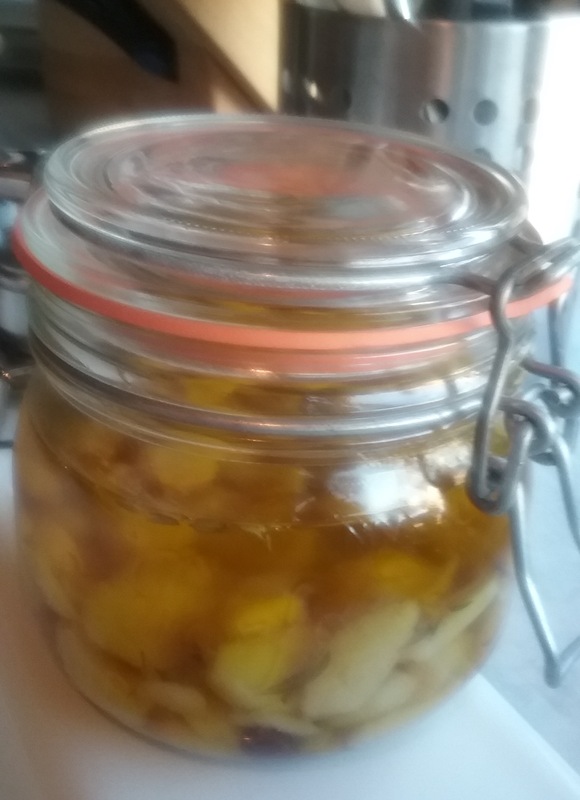 And so it is with my garlic confit. It took 7 heads or approximately 75 peeled and trimmed cloves of garlic. But when you have something this luscious, it is not work. It becomes a Zen meditation on the profound glory of real food. In this an ancient method of preserving garlic, peeled cloves are gently poached in olive or other mild oil, rendering the tamed garlic sweet, soft, and sublimely creamy. In very little time, you receive ready to use garlic, plus a richly infused oil for cooking or flavoring, and garlic with much of its obnoxious odor eliminated. Garlic is good on just about anything. Mash a few cloves with or without butter for instant garlic bread; make a quick salad dressing with a few smashed cloves, a bit of infused oil and a dash of vinegar; toss mashed cloves with steamed vegetables; add mashed cloves and oil to hot drained pasta with chopped tomato and a bit of basil. Or, slip mashed garlic under its skin before roasting chicken. Place the garlic cloves, oil, herbs, and a dried red pepper if desired in a small pan over medium-low heat; cover and poach until the cloves are tender but not browned, about 30 minutes. Cool to room temperature, transfer cloves to a clean 3-cup storage jar and cover with the infused oil. Cover tightly and store in refrigerator for several weeks; keep covered with oil. Use clean utensils and handle with care to avoid contamination. Yield: 2-3 cups. 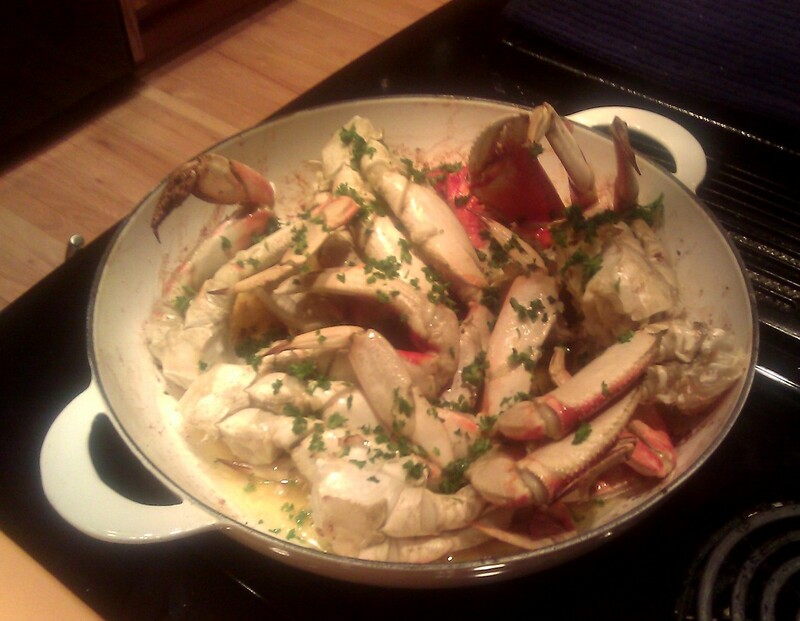 Fresh Dungeness Crab: A Reason to Celebrate! 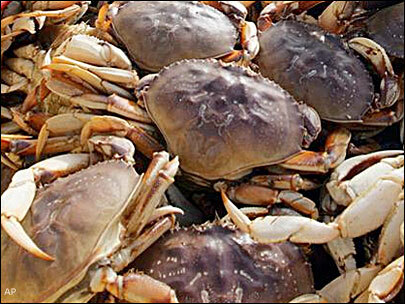 Due to a late harvest, Dungeness crab season this year was delayed until mid-December. 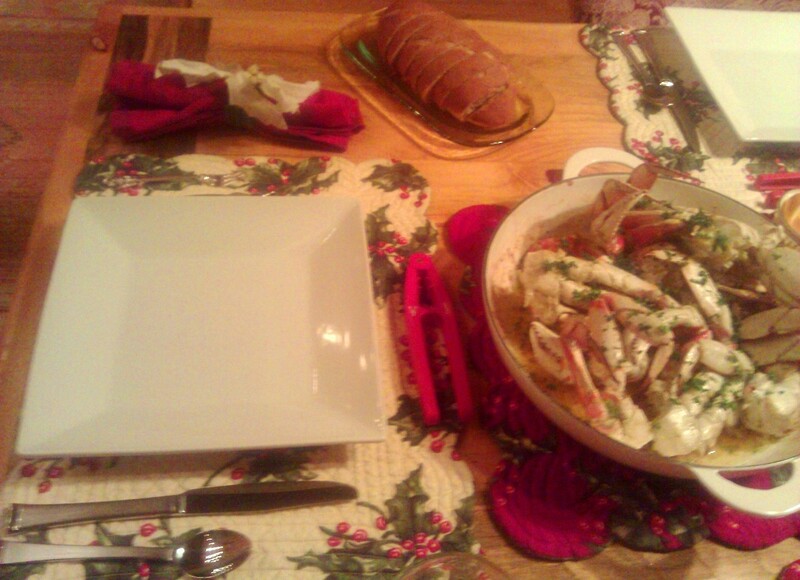 Of course, this gave us even more reason to rejoice because it meant a holiday crabfest! For commercial purposes, this meant crab must meet a 25% meat threshold, or deliver at least ½ pound of meat per 2-pound crab. There’s no way of being dainty when it comes to thoroughly enjoying all that this delicacy has to offer. Armed with a good set of crackers to split the shells open, stray bits of shell and crab morsels will fly off in unpredictable directions. But that’s just part of the fun, so we tend to either dress down or don aprons and/tuck in big napkins for extra protection. Here’s a handy way for everyone to gather around the crab and help themselves to both fabulous garlic dipping butter and portions of crab all in the same pot. Have plenty of fresh bread for mopping up the pan juices! Break the crab into portions and set aside. In a wide pan over moderate heat, melt the butter and add the garlic; allow it to simmer a few minutes to develop flavor then carefully add the lemon juice. Increase the heat slightly and place the crab into the pan. Turn as needed to coat all with the garlic butter. Let cook on the stove top for 5 to 10 minutes; place in 450 degree oven for about 5 minutes or until thoroughly heated. Sprinkle with parsley and serve with plenty of warm bread. Yield: 4.